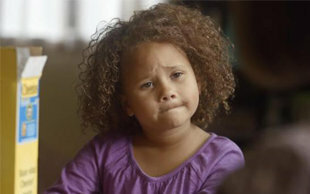 A television ad for the iconic breakfast brand Cheerios featuring an interracial couple and their biracial daughter sparked an ugly rash of racist and insensitive comments. The video touting Cheerios’ heart-healthy qualities and the brand’s place at the wholesome American breakfast table, which aired and was posted online last week, quickly drew more than 2 million hits on YouTube. But the site was forced to disable viewer comments after responses included references to Nazis and racial genocide. “We are a family brand and not all of the comments were family-friendly,” Camille Gibson, Vice President of Marketing for cereal maker General Mills, told USA Today. The racist comments on the ad were also spread virally across the web, including on the social website Reddit. The ad has gained more than 6,000 likes and 1,500 shares on Facebook, but that is just a fraction of the more than 1 million likes the Cheerios page has. In response, the company released additional comments to the media stating that tumult over the ad will not affect future casting or branding opportunities featuring multicultural families. “There are many kinds of families, and Cheerios just wants to celebrate them all,” said Meredith Tutterow, Associate Marketing Director for Cheerios and Multigrain Cheerios. This is just the latest ad to stir controversy.Last month, jcpenney drew headlines after people noticed that the billboard image of a tea kettle it sold resembled Adolf Hitler. Officials at jcpenney, No. 50 in the DiversityInc Top 50, said the resemblance was unintentional, tweeting, “If we had designed it to look like something, we would have gone with a snowman or something fun.” The $40 kettle was later pulled from the jcpenney website and the billboard was taken down. The additional online attention, though, did manage to help the brand completely sell out of its inventory in just a weekend.